HAVOK "More Than Beer, Pizza and Ninja Turtles"
Denver's Havok is not only surviving, but they are starting to make their own mark. Along with Evile and Warbringer, they seem ready to move to another level. But exactly how much of a thrash band they are is a matter of conjecture, especially if you talk to them like I did recently. They see themselves as capable of more than regurgitating the well-worn cliches of the thrash genre and on their latest album "Unnatural Selection", they back up that contention with a varied platter that contains plenty for the thrash purist but also much that will appeal to the fan of straight metal and even hard rock. WORMWOOD CHRONICLES: You guys are known as real road warriors. Do you even remember what home is? MICHAEL LEON: Home...I think I have a home somewhere. I can almost remember it. REECE SCRUGGS: Barely. The van is our home. That's the lifestyle we have, the lifestyle we've chosen. That comes with the deal. ML: It's what we have to do to keep this band moving forward. WC: What lessons has the road taught you guys? RS: It's taught us so many lessons, a book wouldn't even begin to cover it all. We've learned so many things in just the last year. For one thing, you learn how to read people a lot better by traveling the way we do. We've been exposed to all kinds of people and you get a clue on who is beneficial and who is wasting your time. WC: I would imagine one of the things you've learned is how serious you really are about Havok. If you can put up with all those miles, you know you are really dedicated to the band. ML: That's exactly right! The way I look at it is, we've been through so much together, why would you quit now? We've been through the hardest stuff. RS: That's true. We've seen the darkest days of the band. There are times when you almost break. But you don't break and it makes you stronger and more able to deal with hardship. ML: And of course if makes you lot better performers as well. We've all learned so much more about not just playing live, but how to play period. PETE WEBBER: Yeah, I was noticing that myself. Those things are huge! WC: You guys ever see "Kingdom of the Spiders" with William Shatner? 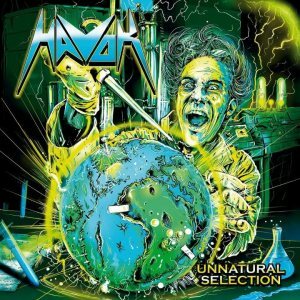 (laughter) Moving on, what was it about "Unnatural Selection" that was different from the previous Havok records? PW: It was definitely more of a collaborative effort. ML: We all had more of a hand in creating it. The earlier Havok material was much more of David's baby. RS: On the "Time Is Up" record, there was transition. Pete and I were just coming into the band. David wrote about 90% of that record himself out of necessity. By the time "Unnatural Selection" came around, me and Pete were fully integrated into the band and we had a good say in the songwriting. Mike was contributing a lot more, too. 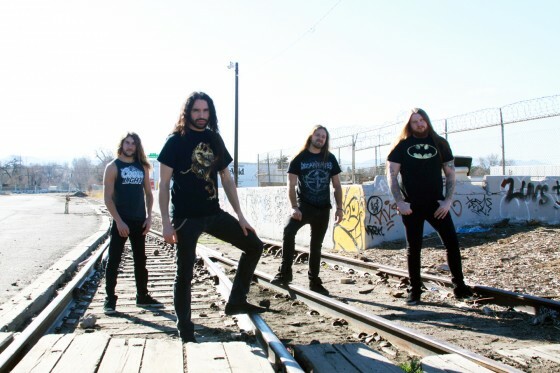 So now, Havok is truly a band. ML: The "Point of No Return" EP was very important for us. That kind of bridged the gap when we were getting Reece and Pete into the band, it allowed us to test the waters. The song that they worked on for the EP was a huge success, that really opened the gates for "Unnatural Selection". WC: That kind of answers a question I had. I wondered if Havok's songwriting was done by more of a "captain" or a "crew". ML: It's definitely more of a crew now. RS: We are definitely a crew now. WC: A lot of the more modern thrash bands are focused strictly on aggression in their music, but you guys have a more varied approach. There's more mid-tempo and intricate stuff. ML: That's definitely by design. We want to show there are more facets to Havok than just blowing doors off. Don't get me wrong, that style will always be a part of the band, but we want to show that we are not so narrow. The non-stop thrash gets kind of old after a while. RS: I think the really great bands will kind of move beyond that tag. WC: I noticed you even have what could be considered funky moments in the new record. ML: That's good, that's what we're shooting for. As a bass player, I can tell you that there is no better sound to play than slap bass from funk! WC: Do you even consider yourselves a thrash band anymore? ML: I think we are moving more to being heavy metal. I would say no. Our desire is to be a great heavy metal band. ML: You are going to see a lot of influences in our music. We draw from death metal, black metal, straight heavy metal...even rock n' roll. There's a whole world of stuff to draw from, but at the core, we are still going to have the Havok sound. We are still going to have speed and power in the band. WC: Well, let's talk about what you do sing about., "Unnatural Selection" seems to me to be a very political record, it takes a strong stand on certain issues. Do you see yourselves as soldiers against oppression? RS: I don't know if I would say we are soldiers but we definitely want to open people's eyes up to what's going on. We feel we have to talk about what is happening in the world. People don't even seem to know that they are being oppressed. Like I said before, we aren't going to talk about beer and pizza. ML: In a way, I see us as kind of like traveling salesmen who go on the road and try to sell our ideas through our music. That's kind of our job, that's what we do. WC: I like that description..."traveling salesmen"! What do you see as the biggest problem facing our society today? ML: For me, it's the monumental dumbing down of everything on every level! PW: I would agree with that. It's the source of all other problems. WC: The internet is a double-edged sword. RS: It's a double-edged sword for sure! You can really learn a lot of things from it, but what's the quality of the knowledge? There's no real foundation for a lot of it. Just a lot of loud voices screaming at each other. ML: The reality shows are the worst in my opinion. They give a totally distorted view of life...life the way people want you to be, not the way it really is. RS: This is the most important part of what we do. Of course we love the music and the energy and the headbanging, but that's a vehicle to carry a message. WC: Is there any room for hope in Havok's view? RS: We hope ourselves that our message gets out there. We hope that people that listen to us will start to think a little bit and see what's going on. Just start to think, period. That's what gives us hope....even the lyrics are bleak. Seeing the effect we have on other people. ML: I think people have wised up to a certain extent in the last few decades. We no longer totally accept the government view. With Viet Nam and Watergate, people started to question things actively. We don't accept things at face value. WC: But now we almost just seem to accept corruption as the way things are done. RS: We're not gonna overthrow things by ourselves but we do what we can in our own way. PW: Yeah, that says it all. RS: I have to admit, I am a major league Batman fan. My reaction to that is, well, it's done, bring it on. I am not too upset by it. ML: To me, Michael Keaton WAS Batman! RS: Yeah, I see if the same way. I'm not bothered by it. RS: Well, there are no creative ideas anymore, so they are real popular story platforms for Hollywood. Somebody else has already written the characters and situations for them. WC: And usually the corporations will dump the aspects that comic fans like and go with something concocted for mass acceptance. Moving on now, do you have any idea how things are going to evolve on the next Havok release? ML: We are going to start taking a look at the darker sides of humanity that people don't want to think about. A lot of the great advances of humanity have come from some of its most horrible events. Slayer kind of touched on this with their song about Mengele, "Angel of Death". RS: We have definitely got some concepts floating around. We come up with a lot of ideas on the road. PW: As far as the musical end of it goes, nothing really concrete yet, but I'm sure we'll be pushing forward. RS: The more we travel, the more we learn, the stronger we get as a band, as performers. I feel we are just now beginning to really hit our stride. WC: If you could invite any three people from history to dinner, who would they be? ML: Whoa, dude! That's a heavy question! RS: Yeah, that's something we don't get asked. ML: That covers a lot of territory! RS: Speaking for myself, I'd say Vlad the Impaler for sure. And then.....maybe Manfred von Richthofen, the Red Baron. And the rest? Man, I don't know. I'd say any soldier from World War One, the French or German side. ML: I dunno, maybe Jesus Christ and Adolf Hitler...something with a lot of contrast. RS: Yeah, if we go the rockstar route, I'd love to talk to Randy Rhoads, Jim Morrison...there's a lot on that side, too. RS: Who would your own three be? WC: Believe it or not, I have thought of that. I'd say H.P. Lovecraft, Jimi Hendrix and Socrates. WC: Do you guys have any "Spinal Tap" moment you'd like to share with the us? PW: How much time you got? That is directly out of Spinal Tap!